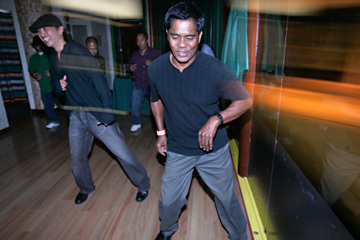 Salsa fans are some of the most loyal nightcrawlers in Honolulu. For years, I've been amazed by the dedication they have to the music and dance of Latin America. So what if salsa is offered on a Monday, Tuesday or Wednesday (the slow nights for most venues), in a mainstream club or at a hole-in-the-wall joint? It doesn't matter. Often times the word about a particular event is spread via e-mail, with little more than a day or two of notice. Still, a few dozen people show up to dance the night away. After a number of failed attempts by other restaurants in the same space at Restaurant Row, the owners of Carnaval Las Palmas appear to be counting on the patronage of salsa fans to keep them afloat in the short term. That means lots of options during the week, with free pupus and dance lessons thrown in to help sweeten the pot. PART OF what makes things so difficult for Carnaval Las Palmas is the lack of visibility, both within the complex and from nearby South Street. Unless you valet park, there's little chance of walking by the front entrance to the restaurant. Even those heading to nearby Hiroshi and Vino will have a hard time noticing the complex's newest addition. That's not to say there's anything wrong with the restaurant itself, since there's a lot of room and the layout is almost ideal for people who like to dance. Glass doors with blacked-out windows at the front entrance open to the main dining room, which is almost entirely cleared of tables and chairs to provide maximum space for dancing. The Ewa side of this room serves as a lounging area, as does the outside lanai. Outdoors is my favorite spot to relax with a drink here, at one of the six tables surrounded by a ring of potted plants and other shrubbery. Three big umbrellas are there to protect you from the elements, and you've got the perfect vantage point of both the dance floor and those people walking by outside the restaurant. An upstairs dining area provides more room to cruise during the late-night hours, although it also serves as Carnaval Las Palmas' VIP area and is not always open to the general public. This is where you want to be if watching the dancers is more your thing, since it provides an even better vantage point of the dance floor than the outdoor area downstairs. Michael Ibanez, left, and Jose Madrid get some free salsa lessons at Carnaval Las Palmas in Restaurant Row. AS OF the beginning of October, entertainment is offered four nights a week at Carnaval Las Palmas. Whether you prefer to head home early or stay out late, there are a number of options. Tuesdays are the newest addition to the entertainment lineup, with DJ Alberto spinning the tunes during "Noche de Nostalgia-Latina." Free salsa lessons are offered from 7 to 8 p.m. each week, and all pupus and cocktails are offered at half-price. If you can make it out, Tuesdays are an affordable option. Saturdays are another DJ night at the restaurant, as Homie and Miriam host "Noche Reventon" starting at 9:30 p.m. Free pupus are offered during the first hour of this party. If you'd rather dance to the music of a live band, check out "Salsa Caliente" on Fridays or "Noche Carnaval" on Sundays. Son Caribe has signed on to play on Fridays, with Wally Rita and His Latin Amigos perform on Sundays. Free dance lessons are offered on Fridays from 9 to 10 p.m. The Barfly drank $5 bottles of Corona in honor of America's neighbors to the south. Domestic brews are available for $4. But where's the margarita menu? Better visit Carnaval Las Palmas with a date -- it's all about dancing at this joint. If you're not inclined to shake it like that, head outside where it's a little easier to carry on a conversation or watch the young hotties making their way to the Ocean Club. You can also smoke out here. Pupus are available until midnight, with a complete dinner menu available until 11 p.m. Standards like taquitos ($5.95), garlic fries ($4.95) and taco de carne ($3) keep things affordable, and my drinking partner for the evening raved about the authenticity of the restaurant's Pozole soup ($6.95). Be sure to brush up on your Spanish -- the staff at Carnaval Las Palmas love to ask questions in that language when they come to check on you. It's obvious (and appreciated) that they're trying to impress customers during their first few weeks of business. We had no problems getting drinks. » HIFF: Oh my, Bai! » Which movie is worth watching?